Matthew had his doubts! He even (jokingly) asked if I was trying to kill him by serving a dish he knew had to be full of milk and cheesy goodness. But it was true! Thanks to Joyfully Healthy Eats he was able to enjoy a big bowl of "potato soup" for the very first time. 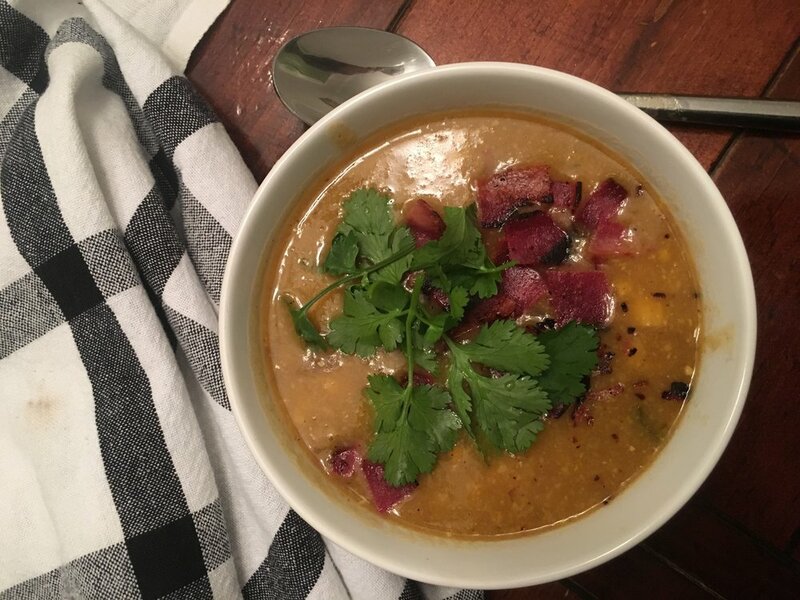 This particular recipe has a Southwestern flair to it (peppers, corn, cumin, etc) and it was the perfect dinner for a few snowy days we had last week. I didn't get any prep pictures taken for this meal. It was a little more time intensive than the recipes I have been making since our boy was born, so I didn't quite have time to! Turn a large stove eye on medium and lay poblano peppers directly onto eye. Roast on each side for 2-3 minutes until skin is charred then remove, turn eye off, and let cool. Prep potatoes, onions, and garlic cloves. Remove charred skin from peppers and dice. Cook bacon as designated on packaging then set aside. In the same pan you cooked the bacon in, saute onions until they appear translucent. While onions cook, dice bacon strips. Add to crock pot: potatoes, onions, peppers, bacon, corn, garlic, spices, vegetable stock, and water. At the end of 4 hours, remove up to 4 cups of the soup from the crock pot and add to a blender. Pour in the coconut milk to the blender also, then blend on high till smooth. Add blender mix back into crock pot, squeeze lime juice in if desired, and stir well. Cook for 10 more minutes. When served, top with cilantro, avocado, or extra bacon!